With our trip logging system, the Mi40, the manual recording of a trip administration finally becomes a thing of the past. The system is capably installed by a specialist fitter after purchase. 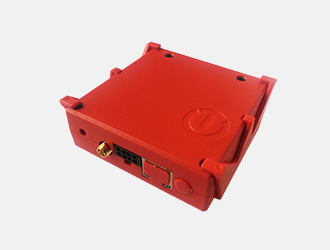 After installation and activation all your kilometers driven are automatically recorded in real-time. Users of our Mi40 trip logging system are assured of fully automatic trip logging. All details of each driven route, both for business and private purposes, are automatically registered. All information about every route can be seen online and in the Moving Intelligence app. Examples include route information such as travelling time, distance, departure and visiting address, post code and house numbers, always real-time and up-to-date. With the Moving Intelligenceapp and the online platform you have one summary of all your vehicles, always and everywhere. All current information such as engine ignition on/off, current speed and driven distance are displayed on a detailed chart and in a table summary. Live tracking is active across the whole world. The free MiApp is available for iOS and Android. Geofencing is the virtual demarcation of a certain location. 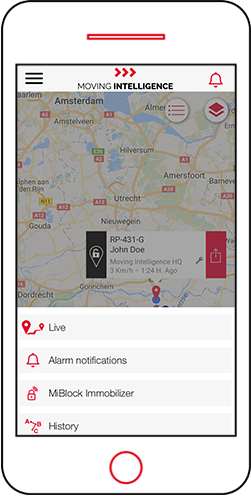 With Lock Positionit is possible to receive a once-only notification onthe online platform and in the app as soon as your vehicle starts to move.As soon as a vehicle arrives outside or inside a pre-set area, youautomatically receive a message by email or a push notificationon your smartphone or tablet. With the Mi40 you can record much more than just mileage administration. The online Moving Intelligence platform enablesa real-time view of the current status of your whole vehicle fleet.With mileage reading reports you then always have a summaryof all mileage readings of your vehicle fleet. With our free Moving Intelligence app you have a clear overview of all you transport resources, always and anywhere. Live Tracking provides real-time insight into the current location of all objects, both online as well as through the MiApp, anywhere. Placement of an ‘electronic fence’ enables you to see when someone enters or leaves a zone. This allows you to receive a noti cation by e-mail or push in as soon as the selected object starts moving. Through the MiApp, it is very easy to di erentiate between personal (P) and business routes (Z). An overview of times when the set maximum speed is exceeded within a speci ed period.